I guess I've been putting this off for a bit because this wasn't the perfect vacation. We stayed on Havelock Island which is gorgeous, full of trees, stunning white sandy beaches and some of the best snorkeling we've ever done. However, the place we stayed in was dark, dingy, hot and buggy: Barefoot at Havelock. I guess I'll start by ranting and raving about the accommodation and save the positive comments and photos for later. First, in order to get to the Andamans we flew east to Chennai (1 hr), then out to Port Blair (2 hrs). The Andamans are way out in the Andaman Ocean, closer to Thailand and Burma than the Indian mainland. We were greeted by Barefoot staff and driven to the ferry terminal, along with a few other families and couples. The ferry tickets were bought and given to us randomly. We handed our tickets over to the guy when we boarded and he did a double take. Each of our tickets showed that we were 30 - 32 yrs and all female except Craig. Yes, Michael became "Manisha" and we all had Indian names. Two hours later we arrived on Havelock and again Havelock staff greeted us and off we went in a jeep for 1/2 hr to the "resort." We left our house in Bangalore at 4:00am and arrived at 4:00pm. Off to our two storey hut. 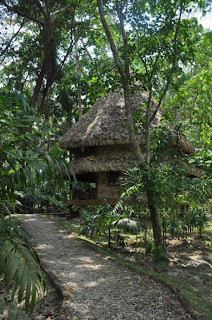 It was a large, two storey thatched hut, quite picturesque with the jungle trees all about. The bottom floor was dark, even with the (low wattage) lights on. We went up the ladderlike stairs to the second room and discovered that it was not enclosed, nor was there a door to the downstairs. There were mosquito nets on both beds, which means only one thing - BUGS. The upstairs area had slightly more light but not much. Now when I look at the Barefoot website I can read between the lines. "Experience the rare gifts of nature" really means "there will be bugs of all types and sizes in your room." And when they say "opens on three sides to the rainforest." it means you have no walls or windows and the bugs are coming in. "Mezzanine floor with low roofing" really means "this place is dark." Anyway to make a long story short the place was dark, dingy, hot and buggy (hmm did I already mention that?). We had a turbo upright fan and a ceiling fan both of which we needed on because of the heat. Sounded like we were in a helicopter the whole time - so much for listening to the crashing waves or the sound of the birds singing. The restaurant food was good but service lacked in all aspects of the "resort." Three of us would get our meal and finish eating before the forth person even got theirs. All in all this was a backpacker experience at "resort" prices. Had we taken a smaller A/C room our experience might have been better as they are sealed off from the outdoors - they have walls to the ceiling. The kicker was that Michael asked when we booked if they recommended A/C - and they said either would be fine, fan or A/C. Barefoot at Havelock bills itself as eco friendly, and true I wasn't scared of the frog living in the bathroom. But did it really want to be trapped in there living in the sink console (we spotted it twice but didn't realize that was it's home til the last day)? What about the hundreds of ants on the toilet and all over the upstairs tea cup and desk that ended up dead? Or the big flying beetle bug that Michael stepped on accidently and killed - that wasn't pleasant for either of them. OK, so that's my ranting and raving, next on to much better aspects of the island - beaches, fish, coral and elephants!